I will start with time savers, since we are all trying to squeeze as much instructional time into our days. 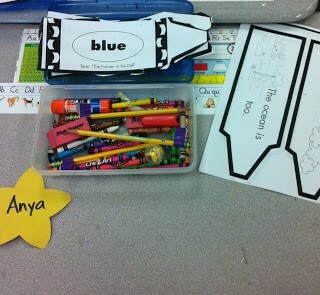 It is a challenge to get your little kinders to stay organized. They tend to want to toss things into their desks which, in turn, creates delays when you want them to find something in their desk later. I always create this chart with my kids. Although it lacks beauty, it is functional. On the left, they keep their Bee Binder and book bag. On right we have their poetry notebook, their math journal, their stations work folder, and their pencil box. Loose crayons, glue sticks, scissors, and pencils are not permitted. All loose papers must be in their Bee Binder. 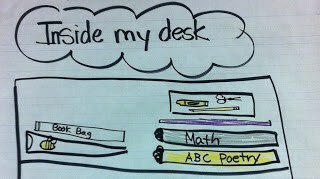 I suggest taking time to train your kiddos (of any grade) how to keep their desks tiddy. This is a life-long skill and it will save you time throughout the year. The desk fairy is making her debut next week… SQUEAL!!!!! My students arrive at various times in my classroom starting at 8:00am, but school does not start until 8:30. It is important for me to have meaningful work for my students to do when they arrive. Each morning my students are given a Read, Trace, Glue, and Draw Paper. 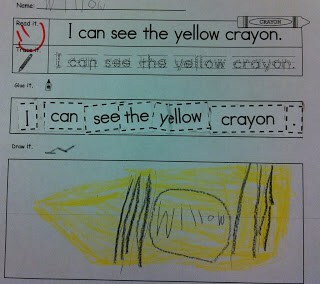 How cute, he named his crayon after himself, Willow! Naturally, this requires some training too. One big helpful hint is to teach your kiddos how to keep track of the things they cut out. This is an example from their Blue Song book. I have my kids place the pieces they need to keep in the lid of their pencil box. The scraps are pushed to the floor until they are all done cutting out. They clean these up once they are all done cutting. When they are done with their morning work, they can create shape pictures. This allows me time to take attendance, get lunch orders, notes, and other various morning business taken care of. To read more about these patterns click Here . That’s all for now… What does your morning work look like? I love the cut and paste sheets. They are so great. Thank you! Thank you so much! I am going to check them out right now! I so need help for morning work! Thanks for sharing these tips. I'm really struggling with getting everything done. We only have about 3 hours to teach everything everyday. It is making me crazy! I love the idea of the kids putting their loose pieces in the lid of their box. Thanks! Oh Kami… Not sure about the coats, but when I was in San Diego, we just had tables. The students had a magazine organizer to put their stuff in. This worked great. We stored them on a shelf (I was in a portable so it was UBER small). This worked really well. You could make a chart ~ inside my box instead. Kerri~ Hang tough… eye on the prize. You will have to be very focused and strategic with your lessons. Try setting the timer, you will be amazed at the time you will find. Good luck Darling! Let me know how it goes! Yay!!! 🙂 THANK YOU Deedee!! I am so gonna start this next week! Just what I needed!! Candace, I got them from Frog Street Press! They are wonderful! You can get the CD if you are musically challenged like me … LOL! They have a book of black-lined masters as well (that is where the little books come from.) Sorry, I don't have anything to email you. If they were "mine" I would share! Thank you so much for telling me! I am so excited to go buy them right now. I'm so glad… Warning… you will find yourself singing the songs in the car, shower, grocery store… Makes my teenage son CRAZY! 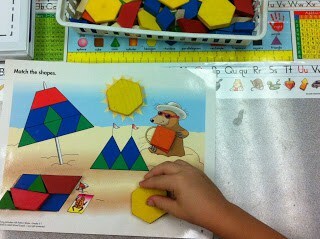 Do your children ever get bored with the shape pictures or do you switch out the activity every so often? My students also stagger in from 7:30-8:00, so I need something to keep those early kids busy. Can they really do this work at the beginning of Kindergarten? !